Crab & Calamari: The Double C! I thought of writing about these 2 kinds of shellfish coz I ‘ve been eating that a lot recently! I’m not a fan of red meat and all the unhealthy processed meat. I replace it by crab slices (with mustard) which I find delicious!! 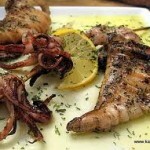 And when at the the beach, I always order grilled squid (Calamari), with some olive oil and lemon juices, LOVE IT!! Besides their lovely taste, Crab and calamari offer great and essential benefits to our brain and overall health! Lets start by talking about crabs! – crabs are one of the highest sources of protein, essential for the growth of children making them stronger and taller. It also keeps hair, nails and skin healthy. – Crabs are rich in Selenium!! Study participants have shown that lack of selenium in the diet can contribute to joint inflammation. Every 100grams of crabs can deliver over 50% of our needs in selenium. 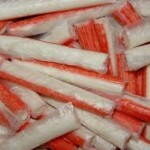 – Crabs are also rich in Niacin. This B vitamin is known to raise the good cholesterol (HDL) in the body and to lower your bad cholesterol (LDL) and triglyceride levels. Crabs are rich in Omega-3 fatty acids that lower fats in the blood and lowers the risk of heart attack and strokes. – It is a good source of zinc, which boosts you immune system and decreases a big range of infectious organisms. Zinc is also very important for normal brain cells functioning, increases concentration and performance. 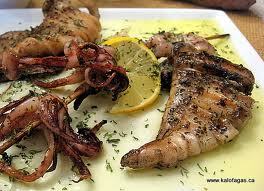 – Squid is a good source of magnesium with its ability to relax nerves and muscles. – Calamari is rich in vitamin B2 (riboflavin), a nutrient that has been proved to lower the frequency of migraines! 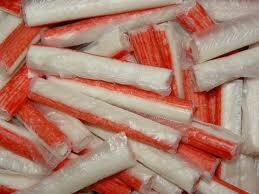 30 grams of Crab sticks have only 26 calories and 0 gram of total fat!